This Half Wit standing just north of Dallas’s Love Field is one of the best looking half wits out there, he is great shape with a nice paint job. 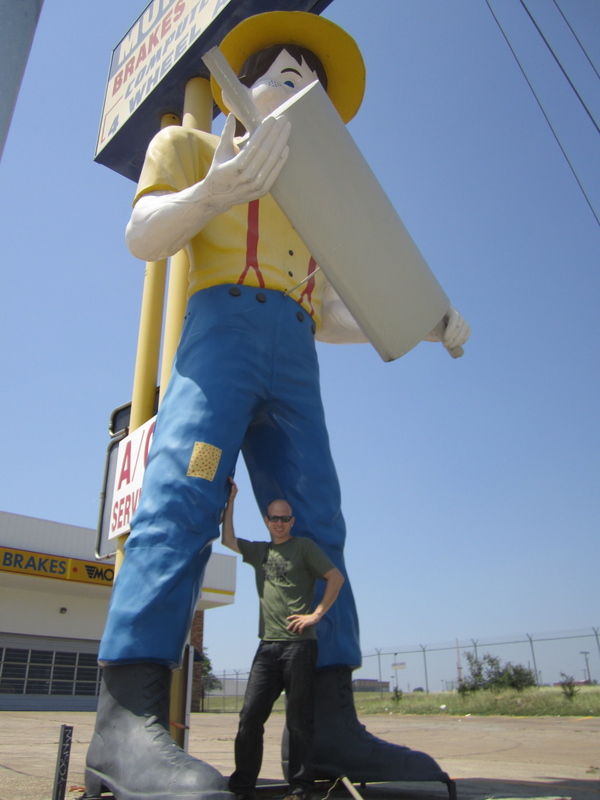 He like the other muffler men owned by Ken holds a muffler and has since the late 60’s. Ken has something unique here in that his half wits appear just the way they did when ordered from International Fiberglass. I have verified that both the muffler and this paint job are original, although both have been touched up a few times since they were delivered in the late 60’s. Another interesting thing to notice is that his feet are the Bunyan model. 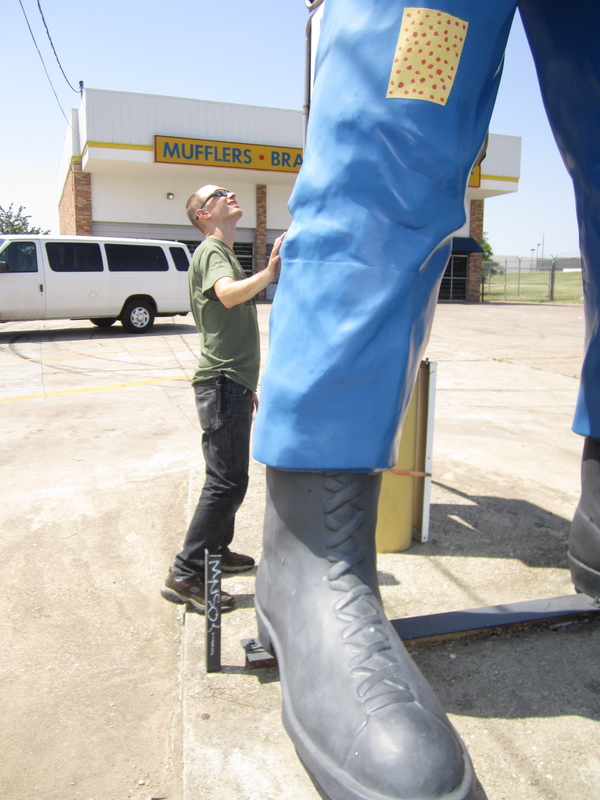 One way to ID a Bunyan Muffler Man is by their legs and feet. They always have their pant legs tucked into the top of their boots as do about 50% of the half wits out there. Ken had two other half wits that I know of, one is my #31 sighting in Beaumont, TX and the other one was located off the Dolphin Road exit in east Dallas and stood on the roof of the muffler shop. It was last reported there in 1998 and after that moved south to Cleburne, TX where it stood for years behind a barn against a telephone pole on private property. It was just sold a few weeks ago and still is in the area. Another interesting thing to note here about muffler men is that they often clearly have a line around their leg just below the knee where they have been cut or fabricated together. I have not seen this on every one but on many. Footless muffler men are common across the states and many are either cut here or farther down at the ankle.